A masterpiece. This fascinating hand colored 1818 map by Edinburgh cartographer John Pinkerton depicts Korea (Corea) and Japan. A spectacular, highly detailed map of this fascinating region with spectacular engraving, practically leaps off the page. 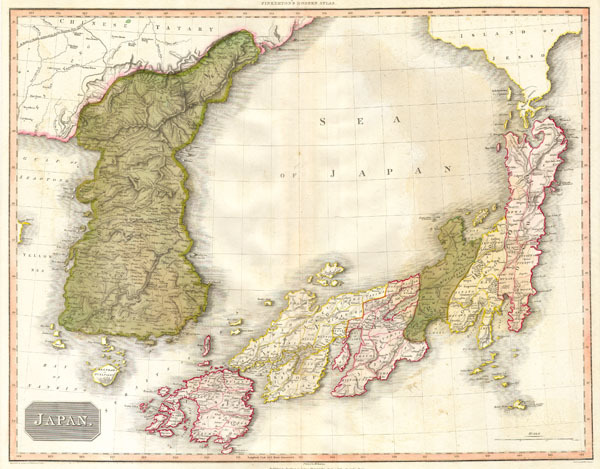 Possibly the finest British atlas map of Japan and Korea to appear in the 19th century. Drawn by L. Herbert and engraved by Samuel Neele under the direction of John Pinkerton. This map was issued in the scarce American edition of Pinkerton's Modern Atlas, published by Thomas Dobson & Co. of Philadelphia in 1818. Very good condition. Wide clean margins. Some minor transference. a Blank on verso. Rumsey 0732.035 (British edition). Phillips (Atlases) 724. National Maritime Museum, 409. Phillips (America) page 806.